The Go Direct 3-Axis Magnetic Field Sensor allows you to determine the magnitude and direction of the magnetic field at any point in space. 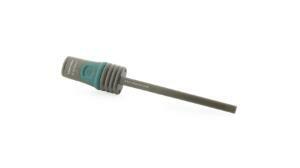 The Go Direct 3-Axis Magnetic Field Sensor measures the components of the magnetic field along three orthogonal axes. This allows you to determine the magnitude and direction of the magnetic field at any point in space. If desired, measure the field along only two axes, or even one axis, choosing the direction that is best for the experiment. Our Go Direct™ 3-Axis Magnetic Field Sensor connects directly to your mobile device, Chromebook, or computer using our free Graphical Analysis™ 4 app—no additional equipment or software purchases are necessary. Go Direct sensors can be used wired via USB or wirelessly via Bluetooth, allowing you to choose the solution best for your classroom or laboratory.